Alternate side of a Panathenaic amphora showing Athena. ca. 375/370 B.C. Martin Streicher (University of Bonn) will introduce the subject “Thoughts about the interpretive significance of Hellenistic Panathenaic Amphorae”. This lecture is part of the Aigeiros lecture series. “Vases play a very significant role in understanding ancient cultures because they were associated with all areas of life in antiquity. This is especially true for the amphorae, which were awarded as prices at the Panathenaic games in Athens,” Martin Streicher explains in the abstract of his paper, and continues: “These Panathenaic amphorae were commonly found at different places across the Mediterranean region from around 560 BC into the Roman period. They were characterized by a standardized iconographic scheme, which showed Athena on the front and the depiction of a sport’s competition on the reverse. 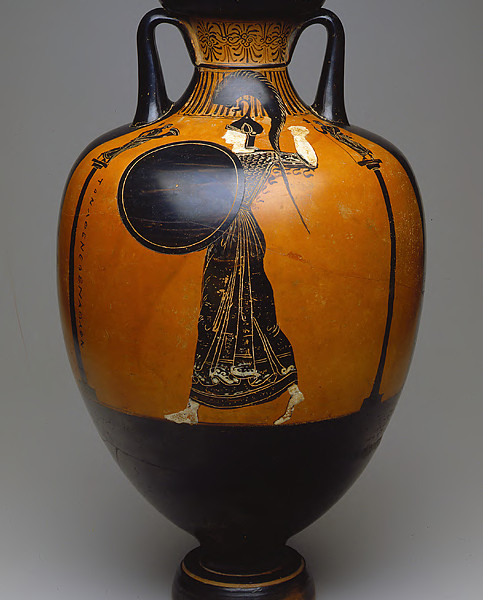 “After the decline of black-figured vase painting, Panathenaic amphorae had remained the only Athenian representative executed in this technique. These vessels’ close relationship with specific sporting competitions and officials results in a series of exact dates for these price vessels. But unfortunately, only parts of the periods during which Panathenaic amphora were produced, have been analyzed in depth. The reason is that archaeologists concentrated on the price vessels from the Archaic and Classical period. This neglected the interesting aspects which arise from the changing social and political conditions during the Hellenistic period. The vessels had undergone several changes from the 4th to the 1st century BC (e.g. form, inscriptions, and technique). Thus, the preconditions for studying the Panathenaic amphorae of Hellenistic times differs clearly from those of the earlier periods. Their lower quantity, the fragmentary state of preservation and the almost entire absence of other contemporary vase painting make a dependable interpretation of this well-known type of vase difficult. “The lecture is dealing with the resulting methodological problems and raises the question how reliable the Panathenaic amphorae of the late period are with regard to further interpretations and a better understanding of the Hellenistic period”. With a response by Eurydice Kefalidou (National and Kapodistrian University of Athens). German Archaeological Institute, lecture hall (2nd floor), 1 Fidiou str., Athens. Thursday, May 12, 2016 at 6.00 p.m.